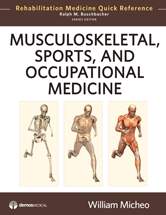 Musculoskeletal, Sports, and Occupational Medicine: Rehabilitation Medicine Quick Reference provides the core knowledge the busy practitioner needs to deliver top-notch rehabilitative care to patients with musculoskeletal, sports, or occupational injuries. Covering 107 alphabetically arranged topics from Achilles Tendinopathy to Whiplash, this nuts and bolts resource is designed to provide concise and accurate information. The book begins with a template for evaluating a patient with musculoskeletal injury, and covers the full gamut of conditions and sequelae commonly seen by practitioners dealing with bone, joint, and soft tissue problems in athletes, injured workers, and individuals of any age with musculoskeletal issues. Every entry is standardized for quick look-up in the office or clinic, and features description, etiology, risk factors, clinical features, natural history, diagnosis, red flags, treatment, prognosis, helpful hints and suggested readings.